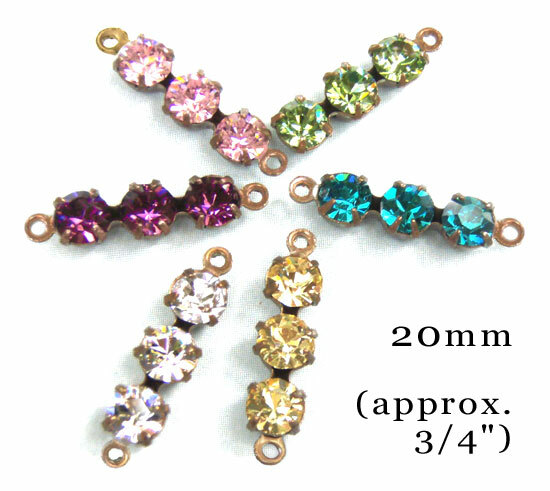 I’ve got a few new colors of these pretty rhinestone connectors in my Etsy shop. If you make jewelry, they’re super useful. Use them as links for bracelets or leading to the focal on a necklace. And when you use them for earring dangles, you can combine them with other jewels to make smashing color combos. Add a peridot teardrop jewel to the rose pink rhinestone connector. Or a shimmering Swarovski pearl to the crystal connectors. Or – well, you see what I mean. These are fun to work with! 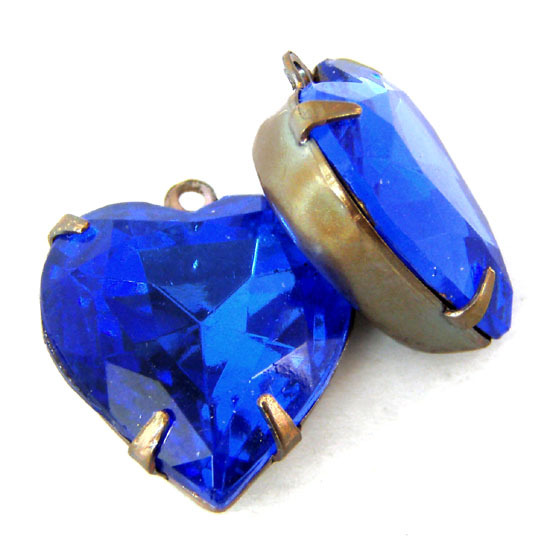 I’m sneaking this in when I meant to get back to my sapphire pear earrings – but I just got these sapphire heart jewels in, and it’s been so long since I had any sapphire hearts. I’m not sure why, but it’s really hard to find vintage heart jewels lately. Maybe because they really are in demand? 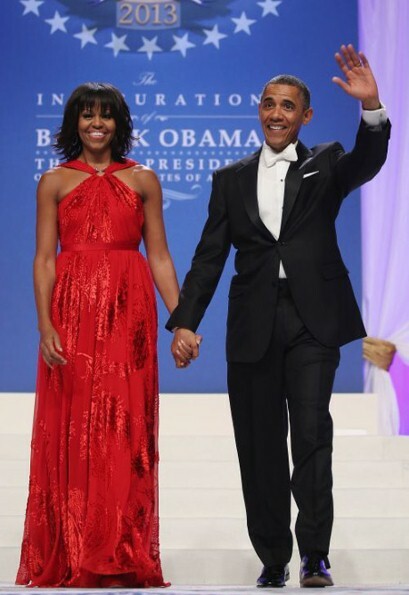 Of course I watched (some of) the inaugural fuss yesterday – I have issues with every politician, but I still think the Obamas are better than the alternative last November – and I am very fond of Michelle Obama. And like a lot of women, I love to see what she chooses to wear! Love it! 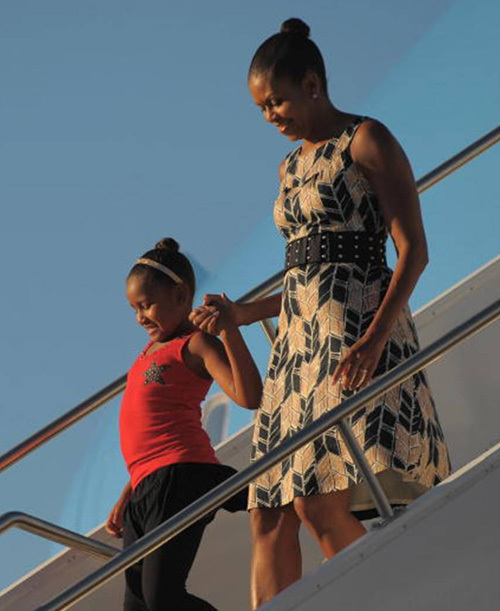 That she’s wearing Target, I mean – I also think it’s a cool dress. Now if we could just get her to show off / promote / wear some American vintage…. that would be beyond fabulous! P.S. And don’t forget to check out her retro shoes. Wowza! I couldn’t resist – I got sidetracked when I found these wonderful vintage finds. THIS is why I love vintage fashion! Now that is just a classic. White linen, it’ll look good forever (and you can bleach it, gently!) 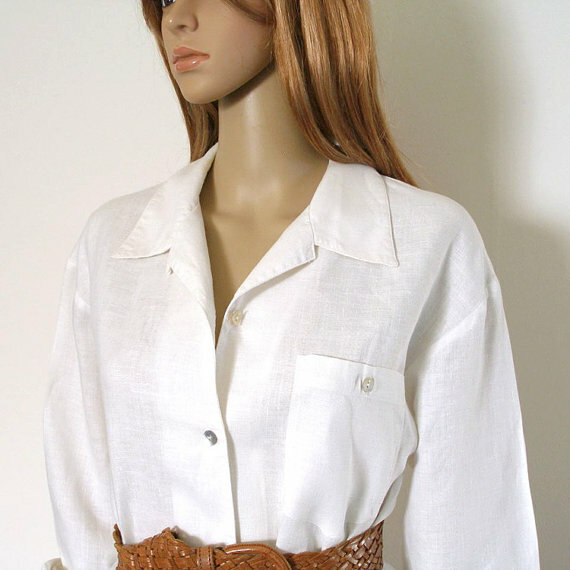 Belt it, wear it loose, wear it over a bathing suit or with black velvet. Totally a classic. I mean, talk about fun shoes – purple, and suede, and ballet flats? Love them. Comfy and adorable. These are from one of my favorite vintage shops on Etsy, Look Again Vintage. Even if these goodies are gone when you read this (and yeah, somebody will grab them) there are always great finds over there. So cool. So fun. And did I mention affordable? I do love vintage! 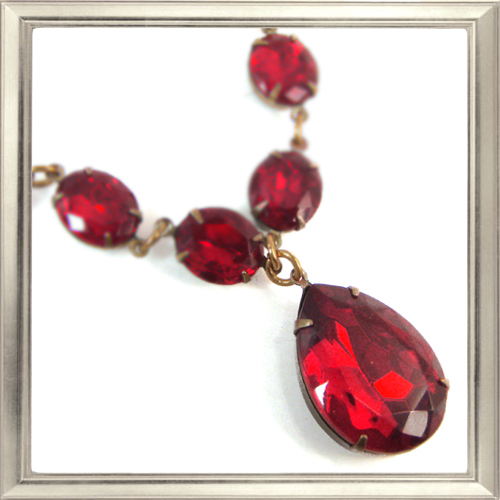 I was looking for a vintage ruby rhinestone necklace recently – a customer request made me curious. She was looking for a Miriam Haskell (or knockoff). Anyway it got me to looking, and I found to my surprise that there were very few to be found! I’m not sure why red, or ruby, is a hard color to find. It’ll be a wonderful Valentine’s present – and yes, it’ll be available through Weekend Jewelry. It’s not even onsite yet – but will be pronto!